Yikes – Lucas is 20!! 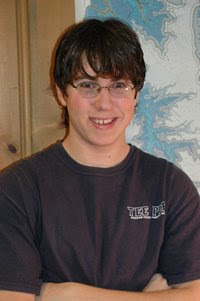 Posted by Chris Reckling on March 28, 2009 Comments Off on Yikes – Lucas is 20!! Lucas turned 20 last weekend, a milestone for everyone, I guess. I dug out some old photos and scanned them in (no digital cameras back in those days!). 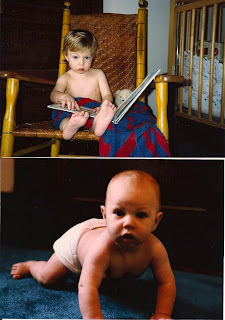 Here are 2 from babyhood. And here’s a more recent grown-up picture. I must say, he’s a great guy! A group I play with regularly made this recording to go on the Folk Song Society of Greater Boston CD (I think it comes out soon, but who knows!?) The arrangement is by Jim Scott. I’m playing bass on it (and finger snap, not at the same time) and the rest is acapella by J. Johnson, David Godkin, Pam Haran (lead), Gretchen O’Neil, and Eric Hanson. I recorded this to our old mac Sound Studio thru a Sony stereo mike. I added a touch of reverb afterwards, then converted to mp3.